Don't miss this short screencast video on Rundeck Enterprise's new Advanced Workflow and Workflow Visualization capabilities. Alex Honor shows off how these two features combine to improve the experience of both job writers and job runners working in complex enterprise environments. The Advanced Workflow capability builds on the new customizable workflow engine recently introduced to Rundeck. Rundeck Enterprise comes with a workflow engine plugin called the “Ruleset Workflow Strategy” that allows you to define when and if steps in a job should run. For example, you can create jobs that branch and merge or create a job that only runs certain steps based on an job option value. Also shown in this video is the handy live-execution visualization that is exclusive to Rundeck Enterprise. With this feature you can now watch a graphical representation of your job’s workflow as it executes. 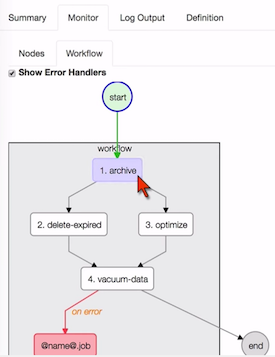 This is in addition to the existing node-oriented view and log output view.